It’s that carrot cake time of year, right? I’ve been seeing recipes popping up for it all over the internet and then last week my mom reminded me about the version she regularly made all throughout my childhood and of course that only added to my craving for it. So a few days ago, when my husband decided to forgo his traditional coconut cake for his birthday treat, uttering the magic words, “you can make whatever you want”, I took that as a sign. I’ve eaten a lot of carrot cake in my life and I don’t say this lightly, but this version, my mom’s (via the pages of the esteemed Silver Palette Cookbook) is just the best. A true classic with a tender and unbelievably moist crumb and that luscious whipped cream cheese frosting. I’ve nipped and tucked the recipe a bit and of course, turned it into cupcakes, but otherwise stayed pretty close to the original, because why mess with perfection, right? Now I know some people have very strong feelings about what should and should not be in their beloved carrot cake. If you’re a purist—meaning you don’t really like anything in there but carrots, this is probably not the cake for you. There is extra “stuff” in these cupcakes. But if you’re willing to be a little bit openminded, I think you are going to love this version big time. By stuff, I don’t mean raisins—that would be sacrilege, but there is pineapple, coconut and walnuts and they add loads and loads of texture and sweetness! Also, this cake, unlike others that ask you to add raw, shredded carrots into the batter, uses cooked carrot purée, so you get a smoother texture and a more uniform “carrotness” throughout the entire crumb. YUM! And let’s not forget about the creamy, dreamy cream cheese frosting that stays soft and smooth even when you refrigerate it. Also, it comes together in a snap and makes for easy piping (although you could totally just frost these with a knife and they will still be knockouts). It’s also just the slightest bit tangy due to the addition of lemon juice, which I think perfectly balances out the sweetness of the cake. You are so going to have to resist the urge to eat the whole bowl as you frost! Not that I know from personal experience or anything! First, you peel carrots with a wide vegetable peeler to get relatively thick strips. Then you cook those strips in a sugar syrup and lay them flat on a baking sheet to dry out in the oven. Next, you wrap them around the handle of a wooden spoon to create spirals and return to the oven to dry out some more and firm up. That’s it! Easy-peasy edible spirals! They add just the right amount of color and cuteness there on top. And just think of the oohs and aahs you’ll get from your adoring crowd! 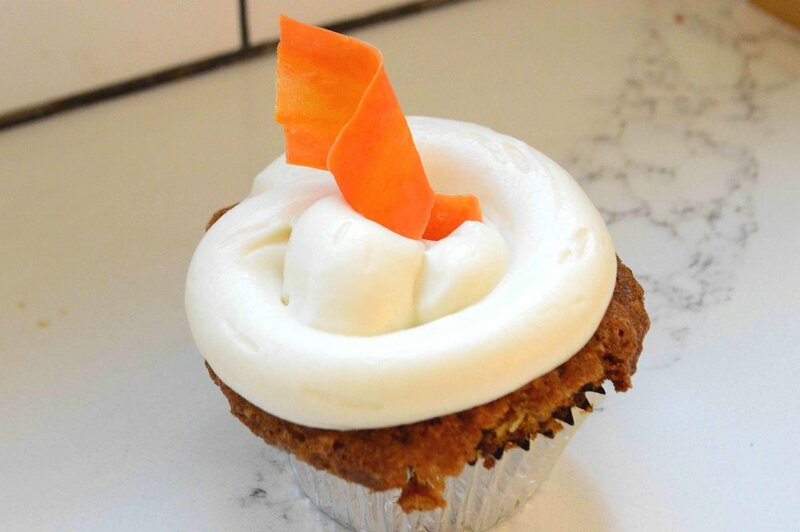 Oh, that carrot cake and cream cheese frosting combo! It’s love with every bite! How amazing would these be for Easter or Mother’s Day which always comes up quicker than I expected?!! The candied carrot curls need to be made several hours or even days ahead, so plan accordingly. 1. 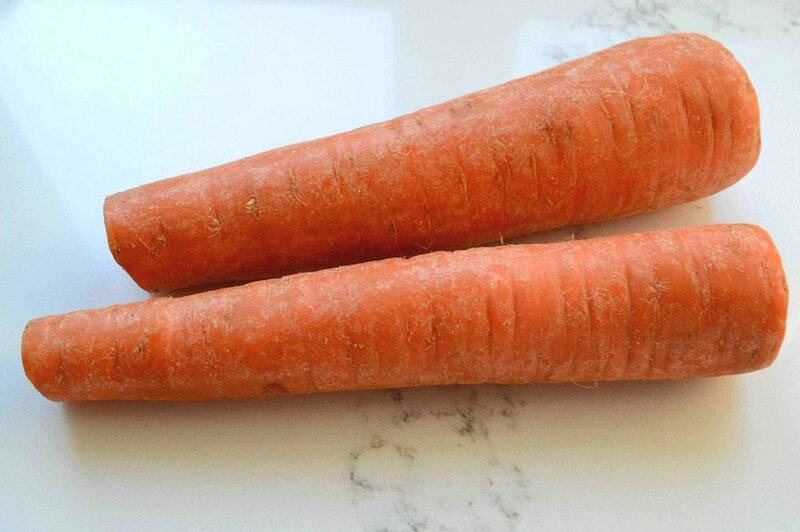 To make the carrot curls: Peel the carrot to remove the outside layer and discard. Then use a sharp vegetable peeler, preferably with a wide blade, to peel wide strips from the carrot, setting them aside, until you have about 15 or so. 2. Place the water and sugar in a small heavy saucepan and bring to a boil, stirring often to dissolve the sugar. Add the carrot strips and let simmer, uncovered, for 15 minutes. Strain in a colander, and set the carrots strips aside for 15 minutes. You can throw out the sugar syrup. 3. Preheat oven to 225ºF and line a rimmed baking sheet with parchment paper. Lay the carrot slices in 1 layer on the sheet. Bake for about 20 minutes, until the strips are dry but still flexible. Wind each strip, one at a time, around the bottom of the handle of a wooden spoon, loosely, so that you create a spiral. Slip the strip off the spoon and return to the baking sheet. Repeat with the rest of the strips. 4. Bake for another 30-45 minutes, until the curls are crisp and dry. Let cool completely, then store in an airtight container for 5 days at room temperature. 5. To make the cupcakes: Preheat the oven to 350ºF and line a standard muffin tin with paper liners. You will definitely have more batter than for just 12. I sometimes fill two ramekins or one large one or use a mini muffin tin or just two more cups of another standard pan. I also usually spray the areas between the muffin wells with a bit of nonstick spray to make for easier removal. Set the pans aside. 6. Sift the dry ingredients into the large bowl of an electric mixer fitted with the paddle attachment. Add the oil, eggs and vanilla and beat at medium speed until well combined. It will be very thick. Scrape down the sides of the bowl with a rubber spatula. 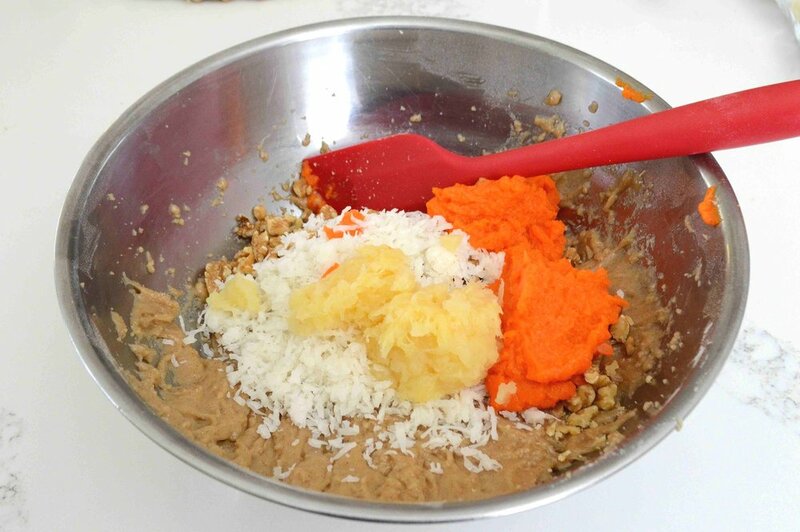 Remove the bowl from the mixer and use the spatula to thoroughly fold in the walnuts, coconut, carrots and pineapple. 7. Divide the batter evenly between the prepared muffin cups and smooth the tops. Bake for about 25-30 minutes until golden brown and springy and a cake tester inserted into the middle of one of the cakes, comes out clean. If you’ve used the extra batter in a ramekin, it may need more time to cook. 8. Transfer the cupcakes in the pan to a wire rack to cool completely. 9. To make the frosting: Use an electric mixer to beat the cream cheese and butter together well until smooth and creamy. Sift one cup of the confectioners’ sugar over the top and beat at low speed, scraping the bowl as needed. Repeat with the remaining two cups of the sugar, beating well between each addition so that the mixture is smooth and creamy. Beat in the vanilla and lemon. 10. Now you can either spread the frosting on the cupcakes with a knife or pipe it on using a pastry bag. 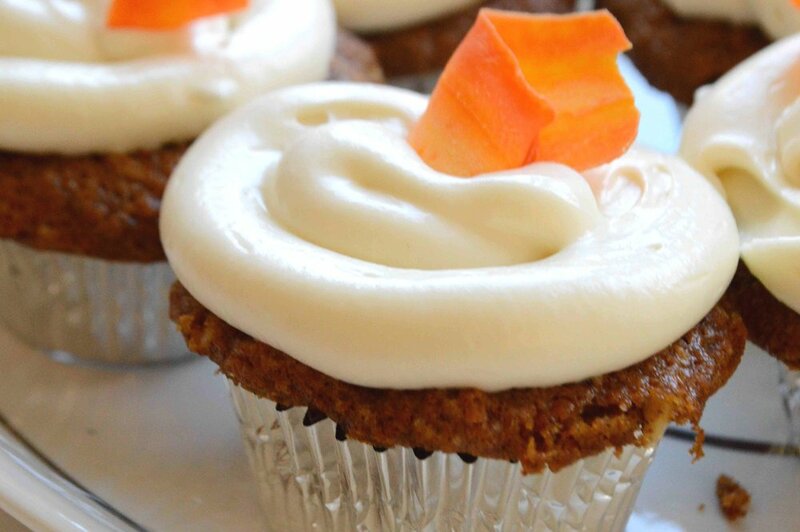 Decorate with little pieces of the carrot curls. Serve immediately or chill, covered in the fridge for up to two days. The frosting will still stay pretty creamy even when cold, but if you like it really soft, bring the cupcakes to room temperature before serving. Note: Recipe for Cupcakes and Frosting adapted from The Silver Palette Cookbook by Julee Rosso and Sheila Lukins; Recipe for carrot curls from Gourmet Magazine. I cut the carrot cake recipe in half—double it to make a 2 layer cake. I also changed the butter/cream cheese proportion in the frosting recipe and used more lemon juice.